No one likes the look or the integrity of an old, oxidized driveway. 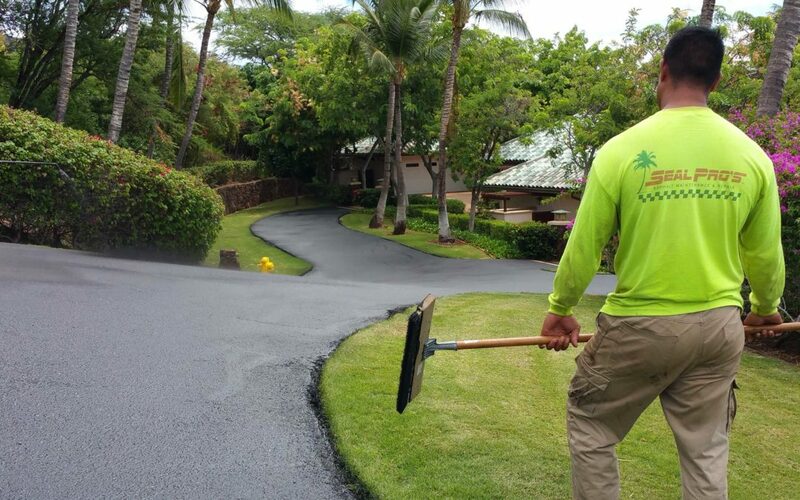 Before pulling the trigger on a brand-new driveway, consider giving your surface a makeover with a fog seal treatment. Fog sealing, also known as fogging, is when a light asphalt emulsion is added to an old surface to revitalize the current pavement. Fogging is an affordable alternative to completely repaving asphalt. The fogging process is used as a preventative form of maintenance, should be reapplied every two years, and is relatively simple. When asphalt is not properly upkept, it begins to form cracks, both hairline and major, that will eventually turn into potholes. Fog sealing helps to slow down this inevitable process, and seals crack to keep out water. Your typical fog sealing project will take at least six to eight hours to dry, and may take longer depending on a variety of factors including the climate and weather. We recommend that your fog treatment dry completely before any vehicles are allowed on it. Our professionals make sure all the details of your project are worked through before beginning any treatment. We go extra lengths to make sure your project is allowed enough time to dry, clearly marking off any areas where fog seal will be applied. Here at Seal Pros Hawaii, we do it all. Paving, driveway repair, color paving, seal coating, striping, fog sealing – you name it! Give us a call at (808) 591-6086 to learn more about our services and to get your job started today!